Veramendi – New Braunfels’ only master planned community – is a modern Texas community with an honest passion for enriching New Braunfels’ trademark appeal, where boundless open spaces inspire neighbors to be active and full of life. Whether you are interested in a traditional single family home, condo, or apartment, Veramendi offers a range of lifestyle choices for you. More than a home, Veramendi provides the necessities you need and the amenities you want. Whether attending one of our excellent public or private schools, receiving healthcare services from a trusted provider, nurturing your soul at a local church, or maintaining physical wellness through the walking trails, it is all here at Veramendi. We have partnered with Howard Payne University, Christus Santa Rosa Health System, Oakwood Church, and New Braunfels Independent School District to enhance the quality of life, and we will continue to partner with organizations and institutions to achieve that goal. Veramendi is organized into four main sections, which provide everything residents need to lead a comfortable, fulfilled life. Veramendi Town Center is the heart of the community. When completed, it will provide the surrounding area with an abundance of excellent boutique retail and dinning opportunities. The center will also provide the neighborhoods and residents with a central hub, designed to provide a strong sense of community with plazas for open-air performances and celebrations. 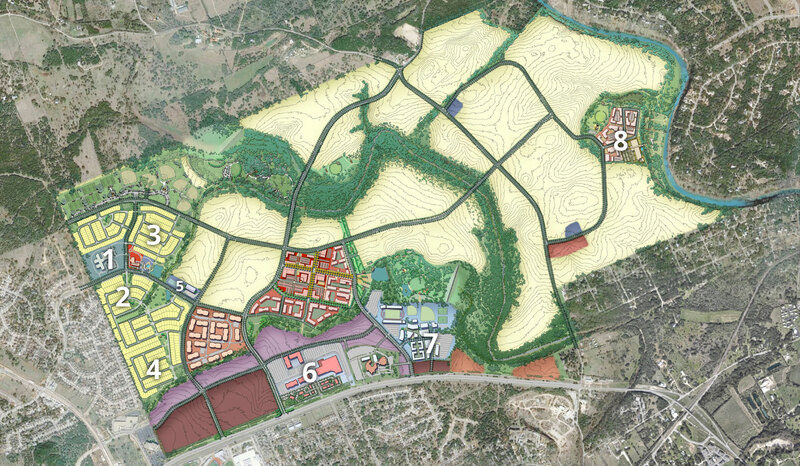 With a mile of frontage to SH Loop 337, the Shops at Veramendi will be the premier retail development in New Braunfels. Veramendi’s retail section, is planned to include retail, entertainment and multifamily residences, designed to create a vibrant and convenient retail center. Veramendi’s planned corporate campus is well positioned and adjacent to the medical and retail sections and within walking distance of the Town Center. The corporate campus is planned to provide single and multi-tenant office buildings for a range of professional services, restaurants, hotels, medical and educational uses. The Veramendi medical section will provide a health hub for New Braunfels. The 30+ acre section, including the proposed Christus Santa Rosa Medical Campus, is planned to include a short-stay surgical hospital, imaging services, emergency services, physicians offices and rehabilitation services; combining state-of-the-art medical facilities with retail convenience and creating a better way of life for doctors, patients and care givers.